Having already written a lengthy article about the Solar System, this article will be but a reiteration. Christ came to Earth as the Star of Jacob, the Light of the World, and the Sun of Righteousness, and He returned to Heaven at 4,000 years from the beginning with Adam. As Moses, Peter, David, and many others have affirmed, these must be 4 days to God, with 1 day as 1,000 years. The sun feeds the world for life, and it symbolizes the sacrifice and works of Christ. Hence, Earth is the 4th when we count Sun, Mercury, Venus, and Earth. Yet, it is the 3rd if we only count planets, just as the Light of the World returns on the 3rd day from the cross (see Hos. 6:1-3). The 3rd day from the cross is the 7th day since the beginning of our history with Adam, and Planet Earth is the 7th planet from Pluto as we draw closer to the Sun. 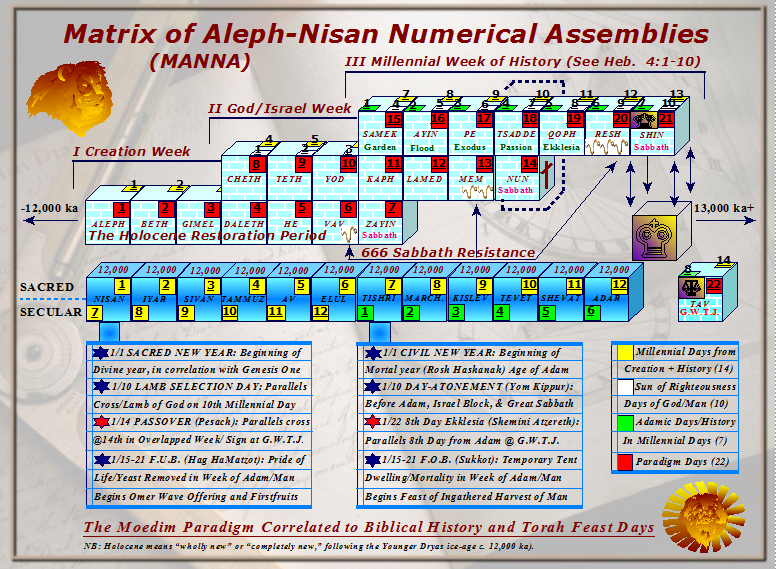 In the Moedim Paradigm, we also find that Christ’s first coming was the 7th day from the middle/Israel week, but it was tenth in overlapping days in the template. Likewise, the return of Christ on the 7th day from Adam will be the 10th day from the middle week for Israel. Thus, the sun is 1st and center but 10th after the 9 planets, and Pluto- the least of the planets and rejected of its heavenly status by many (see Isa. 53)- is also 1st and 10th. With the sun as the 10th and returning, we can count Mercury and Venus as millenniums, making Earth the 13th. The total number of years from the Genesis recreation to the Messianic Kingdom is 12,000, and Christ returns to reign on the 13th day. The last day of the age is after the Great Sabbath, and it is the 14th millennial day- the GWTJ, and Christ was sacrificed on the 14th millennial day to redeem beliervers during the judgement. These things may sound complex, but they are really very simple for anyone willing to learn of the millennial days in the Moedim Paradigm. Further, all biblical holy days will make greater sense from a timing perspective. If someone can count to 13, perhaps with the help of a few toes, they can learn how all of God’s works in our solar system are timely signs in millennial days. Further, they all concern the first and second arrivals of Messiah. I realize that there are many charts and graphs all over the internet with all kinds of peculiar assertions and theories, but I truly believe that those who know their Bibles and have a little knowledge of biblical history can easily learn, and discern as true, these heavenly confessions. (NB: I constructed another feature picture for visualization). One reason that perhaps millions of devout Christians in the West have little interest in the universe, our galaxy, and our solar system is because secular science has basically laid claim to everything in the natural world for themselves and their theories, from asserting godless heavenly formations to creatures creating all their own brilliant biological systems and features- i.e., evolution. Not only that, but secularists take every opportunity to exalt scientism while maligning Bible-believers as “ignorant” traditionalists. Many of them consider calling someone a “creationist” the worst possible insult. Perhaps also because of this, I wanted to remind any believer who reads this site that God created the heavens for His own glory and for praise from His faithful people. Nothing belongs to haughty academia and secularists in science- specifically not to angry atheists. Meek believers in God shall inherit the world and discover much more than mortals currently passing away. God shares His things with His people. When we look to the heavens, we should remember that all things were created to witness to God, with love and brilliance revealed in His works. We should not hope for glory unseen and beauty in death when God is the Creator of a vast, illuminated universe of trillions of wondrous worlds- the God of the living. Indeed, how can we praise God for what we have not seen in spiritual Heaven if we do not appreciate His works and praise Him for the brilliant creations that He created for us to see from here on Earth? I am not a preacher, but I wanted to write this because there is so little interest in the works of God among believers. We are told not to love the world or the works thereof, but the wicked world that Paul and the apostles spoke and wrote about concerned the ways of the godless and this world-age, not the wonderful creations of God. It’s shameful that those who hate and deny God often have greater appreciation for His works than indifferent Bible-believers and religionists. Stand up and fight for this faith. Learn of all the wonderful works He has done, both in time and space.